Devarayanadurga is a hill station situated near Tumkur. The hillock is surrounded by thick forests and the hill top has a number of temples out of which the temples dedicated to Yoganarasimha and Bhoganarasimha are major draws here. The temples are located at an altitude of 3940 ft above sea level. The place was originally named as Anebiddasari and was later renamed as Jadakana Durga in honour of a chief named Jadaka and was later on renamed as Devarayanadurga after it was captured by Chikka Devaraja Wodeyar. By Air: The nearest airport is the Kempegowda International Airport which is located at a distance of 83 km from here. The airport is well connected to most of the major cities across the country and to a number of them abroad. By Train: Tumkur is the nearest railway station which is located at a distance of 11 km from here. The station receives various trains from different parts of the state and has frequent trains from Bengaluru. By Road: One of the best and most preferred modes to reach Devarayanadurga is by road. One can choose to drive up from Bengaluru city in his/her own mode of transportation or make use of the less frequent bus which leaves from the Majestic Bus Station and takes you all the way up to the entrance of the hill. Bengaluru via Nelamangala, Dabaspet, Maddenahalli, Devarayanadurga via NH 48 which would take you about an hour or two to reach the destination. The roads leading to Devarayanadurga are well maintained as the highway connects you to various other major towns and cities across the state. The road takes you through some of the industrial areas on the outskirts of Bengaluru city such as the Peenya industrial area, along with other major places such as Nelamangala, Hesaraghatta, etc. As the place is very close to the city of Bengaluru, most people head out to this beautiful destination during the weekends. Many prefer to reach here during the early morning hours as the place gives you a brilliant view of the sunrise amidst the thick green cover surrounding the place. Dabaspet is often considered as an ideal place to stop over for breakfast; there are plenty of places for one to eat on the highway. Most people prefer to have their breakfast from the Kamat restaurant on the highway and further proceed towards to the destination which is around 20 km from here and would take you about half an hour to reach the place. Shivagange is a well known mountain peak which is located here. The mountain has the shape of a Shiva linga and hence is considered holy. One can also find a spring nearby, which is named as Ganga. The place is also known as Dakshina Kashi and has many temples dedicated Lord Shiva, Honnamma Devi and many more. One can find a statue of Nandi which is carved on top of the steep rock which attracts many visitors from various places across the state. Devarayanadurga is well known for its marvellous views of the surroundings. 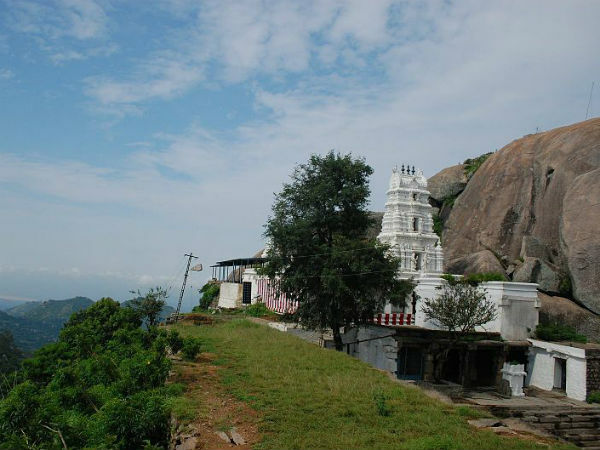 Other than this, the hill is known for the historical temples dedicated to Lord Narasimha. The temples are constructed in the Dravidian style of architecture and are believed to have been constructed by Kanthirava Narasaraja I who happened to be the King of Mysore. There are two temples here, one dedicated to Bhoganarasimha at the base of the hill and the second dedicated to Yoganarasimha at the summit of the hill. Further up there is another temple dedicated to Lakshmi Narasimha, Hanuman and Garuda. The Hanuman shrine is said to be older than the Narasimha shrine and the Hanuman is known as Sanjivaraya here. At the base of the hill, one would come across a natural spring known as Namada Chilume. According to legends Rama, Sita and Lakshmana are believed to have taken shelter in the hill during their exile period. Rama was on the lookout for water to apply tilak on his forehead, but could not find any water; hence, he shot an arrow at the rock which made a hole and water started to flow. At a distance of 20 km from here is another well known temple of Goravanahalli. The temple is dedicated to Goddess Lakshmi. The idol of the goddess is said to be a self manifested one and is considered as a very powerful deity who answers the prayers of her devotees.